It seemed almost too good to be true: The best team and personal rivalries in the NFL in the conference championship games. No way it would happen. Not with the way the unexpected has taken over the NFL postseason in recent years. To get the Seattle Seahawks hosting the San Francisco 49ers in the NFC Championship Game and have Peyton Manning vs. Tom Brady XV in the AFC Championship Game would require all four favored teams to win in the divisional round. And that just couldn’t happen, right? Well, it did. For the first time since Jan. 15-16, 2005, all four favored teams in the divisional round took care of business. Order has been restored to the NFL playoffs. In the postgame locker room, the 49ers did their standard "slap hands" thing, in which they all high-five one another. Then, coach Jim Harbaugh gave a brief speech and asked who had it "better than us." The answer, as always, came back: "Noooooobody." And then, as the players dispersed from the middle of the room toward their lockers, Niners offensive coordinator Greg Roman grabbed quarterback Colin Kaepernick. "You know where we’re going now," Roman said, matter-of-factly. Right about that time, Seahawks wide receiver Doug Baldwin tweeted, "Wouldn’t want it any other way…"
Neither would much of the football-loving nation. At this point, to have these rivals facing each another for a trip to the Super Bowl is about as good as the NFL fan could have it in the NFC. Truth be told, the yapping between the teams has been better than the play on the field. The Seahawks blew out the 49ers 29-3 in September. The Niners responded last month with a 19-17 win in a somewhat entertaining game at Candlestick. Last year, it was the same deal — a close loss for Seattle in San Fran and a blowout victory for the ‘Hawks at CenturyLink Field. If not for a furious comeback victory by the Atlanta Falcons over the Seahawks in the postseason, there would’ve been the rematch in the NFC Championship Game that many were hoping to see. Now, we’ve got it. 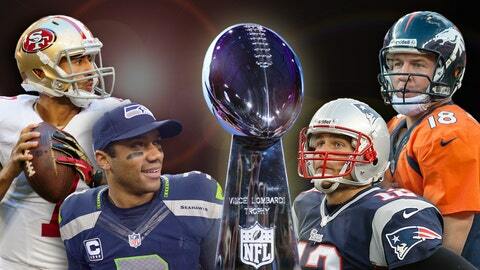 And though the Seahawks have owned the Niners in Seattle, expect this one to be a much, much better contest. For one, the 49ers are the hottest team in the NFL right now. Their win over the Carolina Panthers was their eighth consecutive victory. There’s plenty to be said for momentum in the NFL playoffs these days. The Niners, a week removed from a frigid, physical game in Lambeau Field, were also able to withstand a big punch in the mouth from the Panthers in the first half. Once that game settled down in the second half, the 49ers clearly became the more physical team. In other words, from a mental toughness standpoint, they’re in top form right now. So while they’ve melted amid the din of the "Clink" in their past two trips to Seattle, this team right now doesn’t seem likely to fall apart anywhere. "You’re very proud of your team when they do that, when you go out on the road and in the playoff game and beat another team that’s a very good football team in their stadium," said Harbaugh, whose next line has to make one chuckle, given his ballerina-type pirouette on the sideline: "Yes, it does make you feel like a strong, mighty man." The game will be a matchup of strong, mighty men. And it will be won in the trenches, particularly when the Seahawks have the ball. In their past six games, the 49ers have allowed the opposing team to rush for more than 100 yards only once. And in their past six games, the Seahawks have been held under 100 rushing yards only one time. That would be their loss to the 49ers, when they had just 86 yards on 23 rushes. It’s the play of the 49ers’ linebackers that’s making their front seven so ferocious right now. Defensive player of the year candidate NaVorro Bowman, inside linebacker Patrick Willis and outside linebacker Ahmad Brooks were credited with a combined 28 total tackles Sunday at Carolina. Those guys will be watching the film of the New Orleans Saints’ defenders unable to wrap up Marshawn Lynch (again) and realize it’s on them to make sure that doesn’t happen next weekend. Just like it didn’t happen in Carolina. "(Defensive coordinator) Vic (Fangio) told us last night, ‘I’m challenging you guys to come out and play the best defense you’ve played all year because that’s what it’s going to take,’" Willis said. "He talks all the time about packing the defense on the road. And I think, for the most part, we did that." Get ready for an even bigger challenge. And a better, more physical game than these teams have played in Seattle before. It’s nice to know a guy who’s portrayed as a film-devouring, recovery-drink-pitching football robot likes to unwind like many of us. "What’s weighing on my mind," Manning told reporters after the Broncos’ victory Sunday over the San Diego Chargers, "is how soon I can get a Bud Light in my mouth after this win." That was Manning’s reply to a question about his future. Manning also didn’t take much time to reflect on his latest matchup with Brady. He’ll dabble in that department later this week, though Archie Manning told me last year before the 13th matchup of these great quarterbacks, neither will truly understand how great their rivalry has been until they both retire and reflect upon their careers. Manning and Brady don’t face one another on the field. They face the opposing defenses, as they’ve pointed out in the past. But the ratings and buzz of these matchups tell us all we need to know about what it means to have two future Hall of Fame quarterbacks opposing each others’ teams. And for as much flak as Manning has received for his postseason failures over the years (see this past Sunday’s Denver Post with the cloud over his head), this is his chance to cement a pretty important part of his legacy. Manning has only four victories against Brady’s Patriots, while Brady has beaten Manning’s teams 10 times. But in the postseason, it’s 2-1 Brady, which means Manning can pull even in playoff games. And if the Broncos win on Sunday, Manning would have two AFC Championship Game wins to Brady’s one in this series. That’s a pretty important piece of this rivalry Manning can nail down. Despite everything else he’s done in the playoffs otherwise, and the advantage Brady has overall, Manning has a chance to get the edge in matchups with Brady when it mattered most. Not that he was mulling that opportunity on Sunday. "(A postgame beer) is priority No. 1," he deadpanned to a room full of raucous laughter. "That was an intense game, up-and-down and a lot of emotions. Even the Patriots is ahead and that question (about his future) is way far ahead. I’m not there. This team’s been (through) a one-week-at-a-time season. For all we’ve been through — losing our coach, losing a lot of guys to injuries — that approach has served us well. And we need to keep that approach from here on out." • Coaching carousel: Best guess at how the rest of the jobs will be filled: Minnesota Vikings (Mike Zimmer), Detroit Lions (Ken Whisenhunt), Tennessee Titans (Dan Quinn), Cleveland Browns (who knows?). • Adam Gase: As FOX Sports’ Jay Glazer reported on Sunday, the Broncos’ offensive coordinator is the Browns’ top target, though he won’t interview until Denver’s season is over. Even then, I’ll say he doesn’t take Cleveland’s job, thus leaving the Browns to take a fallback option (Todd Bowles?) once again. • Bowles: There have been reports Zimmer’s second interview with Minnesota will be this week. Don’t be surprised if Bowles gets his, as well. • Percy Harvin: Concussions are too tough to predict, but a source said Harvin felt pretty good after Saturday’s game and again on Sunday. He and the team are hopeful he’ll be cleared for the game against the Niners. We’ll see. • Final Four quarterbacks: Don’t get too caught up in the fact Manning, Brady, Kaepernick and Russell Wilson threw only three touchdowns combined this past weekend. The real stat to measure their success this month is that they’ve thrown a combined two interceptions in 137 attempts. That’s a rate of 1.5 percent, which is excellent.